The 100% American-made Ruger American Rimfire™ bolt-action rifle builds on the enormous success of the centerfire Ruger American Rifle®. With many of the standard Ruger American Rifle® features, this new line also combines several design innovations from the popular 10/22® rimfire rifle. This combination, along with the rifle’s adaptability, appeals to bolt-action enthusiasts – whether young or old, novice or experienced. The Ruger American Rimfire™ bolt-action rifle is available in both standard (22.00″ barrel/13.75″ length of pull) and compact models (18.00″ barrel/12.50″ length of pull), each in either .22LR, .22 Magnum and .17HMR. At first glance, Ruger’s 8301 American Rimfire rifle looks like any other low-end hunting rifle sitting there in the rack. It is not until you get one in your hands that you begin to understand what Ruger has accomplished in a sub-$330 firearm that is commonly found on sale for less than $260. The textured composite stock coupled with the blued satin finish give the 8301 a sleek, durable look. The rifle is very lightweight and feels extremely comfortable to draw. I think Ruger got the ergonomics right on this one and the inclusion of the interchangeable stock modules that allow you to perfect the fit are a welcome addition. The 60˚ bolt action and trigger-pull are crisp and smooth. I really loved the extended bolt handle and the Ruger Marksman Adjustable™ trigger that came with it. I also liked the extended magazine release and the fact that it uses the same detachable magazine platform as the 10/22. I was also impressed with the free-floating hammer-forged barrel which I am sure will improve the accuracy of the 8301. The 8301 includes a Williams™ fiber optic front sight and an adjustable folding-leaf rear sight. The composite stock is made from a lightweight, weather-resistant synthetic polymer that is ergonomic, non-marking and very durable that includes modern forend contouring and grip serrations. Each Ruger 8301 rifle includes two interchangeable stock modules that provide comb height options for scope or iron sight use. The standard models come with long length of pull modules, while compact models come with short length of pull modules. The .22LR and .22 Magnum are both available in a regular or compact model. A regular sized rifle can be converted to the compact, or visa versa, simply by purchasing a new stock comb for $19.95. All four stock modules are completely interchangeable across all models and are available at ShopRuger.com. Simply by removing the rear sling swivel stud, stock modules can be changed in seconds. Some of the stock modules provide a small storage compartment where you can store some survival gear like a thermal blanket, fishing gear, ferro rod, gun-cleaning patches, a small tube of gun oil or even extra ammo. However, any gear that you store adds weight to the rifle and changes the balance-point. 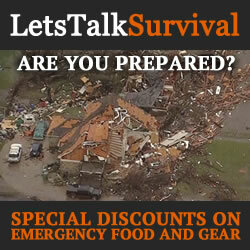 Additionally, the gear should be packed in a way that would prevent it from rattling. Models chambered in .22LR feature the detachable, flush-mounted 10/22 BX-1 10-round rotary magazine. But it accepts all 10/22 magazines, including the BX-25 and BX-25×2. Models chambered in .17HMR and .22 Magnum use the detachable, flush-mounted JMX-1 9-round rotary magazine. 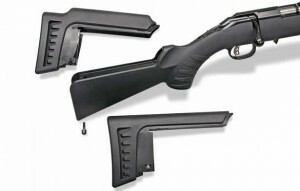 All models feature the easy-to-use 10/22-style extended magazine release which provides smooth, no-fuss magazine removal. Ruger has included their Ruger Marksman Adjustable™ trigger in the 8301 offering a crisp release with a pull weight that is user adjustable between 3 and 5 pounds. 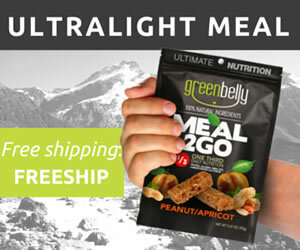 The trigger-pull is short and very smooth without any noticeable creep or overtravel. Since I was just trying the 8301 out, I opted to leave the pull weight at the default setting. The trigger system incorporates a trigger release (or trigger safety) which must be pressed before the trigger can be pulled. The trigger guard is integrally molded into the stock. The 8301 also features a highly visible tang safety which is easy to operate with your thumb. It is located at the top of the grip so it can easily accommodate both right and left hand shooters. The bolt can be cycled with the safety in either position. However, the firing pin must be in the cocked position to switch the safety to the “safe” position. This is done simply by cycling the bolt. Ruger also implemented their patent-pending Power Bedding® integral bedding block system that positively locates the receiver and free-floats the barrel greatly improving the accuracy of the rifle. The barrel is satin blued, target-crowned and hammer-forged resulting in ultra-precise rifling that increases the accuracy and provides exceptional longevity and easy cleaning. 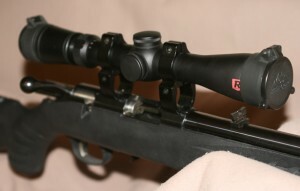 Ruger has provided a 3/8″ rimfire scope base is machined into the receiver, which is also drilled and tapped for Weaver® #12 bases which are not included, but are available at ShopRuger.com. The 60˚ bolt operation is smooth and provides ample scope clearance with the extended handle. The receiver-mounted bolt release allows for the removal of the bolt without requiring a pull of the trigger. 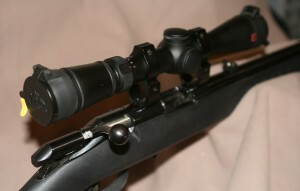 This is a unique safety feature among rimfire, bolt-action rifles. 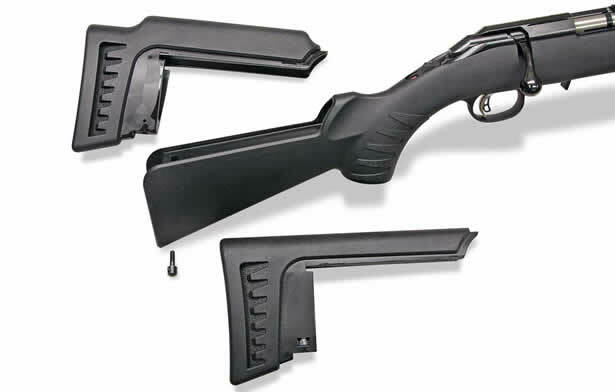 The 8301 also includes a Williams™ fiber optic front sight and 10/22-style adjustable, “V” slot, folding-leaf rear sight. For much of my accuracy testing, I decided to attached a Redfield Revolution 2-7x33mm Accu-Range to the 8301 with a pair of Leupold Rifleman 3/8″ Rimfire Detachable see-thru scope mounts. I chose these mounts specifically so I could continue to use the iron sights as well. The mounts fit the 8301s 3/8″ rimfire scope base perfectly, the scope was leveled and mounted firmly. Additionally, the raised scope mount left plenty of room around the action. After trying out the different stock modules, I chose to use the module with the lower-comb height as my ear protection was obstructed by the taller-comb while looking through the scope and the iron sights. 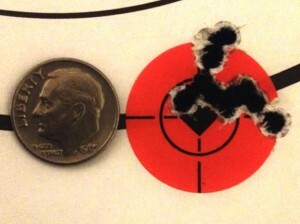 The 10-round BX-1 rotary magazine was easy to load and inserted firmly into the rifle. The extended magazine release was effortless to operate and the magazine dropped out without issue. With the 60˚ bolt throw, the extended bolt handle had plenty of room to operate, even with a scope mounted. The longer bolt handle provide just enough leverage to yield a smooth, crisp action. Especially when properly oiled. Since the 8301 is a bolt-action rifle there wasn’t any blow-back causing the action to become fouled, so cleaning couldn’t have been any easier. The 8301 ejection process begins with the cartridge being held firmly against the bolt face by the positioner spring as the bolt is pulled to the rear of the rifle. The rearward movement basically pulls the rear of the casing into a fixed ejector which in turn causes the casing to flipped out of the ejection port. On occasion, I found that the extractor was not able to grab ahold of the casing and had to be extracted by hand. However, this only occurred a few times with some of the cheaper ammo I had on hand. With the current shortage of ammo, the slower rate of fire was a blessing for me. I was able to spend a couple of hours at the range while only shooting off a couple hundred rounds. Additionally, the slower rate of fire has forced me to concentrate much more deeply. My breathing technique and finger control have also greatly improved simply by focusing more intently on each trigger-pull, which has substantially improved my accuracy. The 8301 shot consistently with groupings at 1″ or less no matter which ammo I threw at it, at a distance of 25 yards. Sadly, 25 yards happens to be all the way out at my local indoor range, and I don’t have an outdoor range close enough for me to go as often as I need to. I am sure that my groupings would have been even tighter had I been using a competition-grade ammunition. 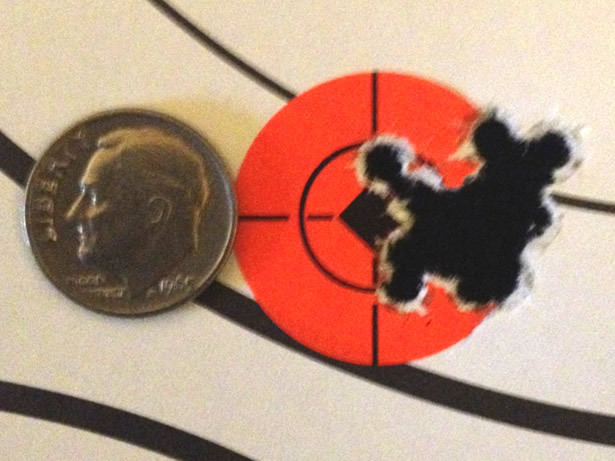 However, in these photos I was shooting at 1″ target stickers with a mix of Remington Golden Bullets, Winchester bulk and likely some Federal bulk mixed in. For these shots, I used a Redfield Revolution 2-7x33mm Accu-Range set to a power of 4. However, at 25 yards with the same cheap ammo, I found the iron sights to be nearly as accurate. I am sure sooner or later I’ll get to an outdoor range where I can see how this rig does at 100 yards. So what can be said about Ruger’s 8301 American Rimfire 22LR? I can honestly answer that I love this rifle and that I’m dying to try out the .22 Magnum model! The 8301 has truly been a pleasure to shoot and just as accurate as I could have hoped for in a low-cost rimfire. The slower rate of fire from the bolt-action has definitely forced me to concentrate and shoot much more accurately as a result. That for me makes target practice much more enjoyable. I truly believe that this rifle is perfect for young enthusiasts who are just learning to shoot and for those who would like to learn to shoot more accurately. Additionally, since the bolt operation replicates that of most long-range hunting rifles, the inexpensive muscle-memory training that this rifle can provide is priceless. You can shoot for hours with this rifle for less than $20 bucks worth of ammo. Sturm, Ruger & Co., Inc. is one of the nation’s leading manufacturers of rugged, reliable firearms for the commercial sporting market. The only full-line manufacturer of American-made firearms, Ruger offers consumers over 400 variations of more than 30 product lines. For more than 60 years, Ruger has been a model of corporate and community responsibility. Our motto, “Arms Makers for Responsible Citizens,” echoes the importance of these principles as we work hard to deliver quality and innovative firearms.